How much debt will you actually get into by going to university? - Which? While the amount of debt you come out with is based on how much you borrow, what you actually end up paying back depends on how much you earn. Student debt is rarely out of the news. According to the Institute of Fiscal Studies in 2017, the average student in England will graduate with debts of over £50,000 – those from poorer backgrounds will incur more, with more loans available to them. However, you should remember that your loan repayments are calculated based on what you earn, not on what you borrowed (the total student ‘debt’). You also need to be earning a certain amount before you start to pay it back. Note, this advice is for students who are on Plan 2 repayment plans, which means you’re from England or Wales, and started your degree on or after 1 September 2012. If you’re from Scotland or Northern Ireland, or you started your degree before 1 September 2012, you’re on a Plan 1 repayment plan. Your tuition fee loan and your maintenance loan are added together to give the total amount of debt. The variations in how much you might have borrowed means it's difficult to say the exact level of debt you’ll graduate with. You’ll build up interest on your student loans too, with this added from the date of your first payment ie while you're studying. How much this interest is depends on the current UK Retail Price Index (RPI) at that moment and your employment circumstances. RPI is a measure of inflation, published each month by the Office of National Statistics. As of April 2019, RPI sits at 3.3%. Remember, you won’t have to pay anything back until you earn above the repayment threshold; but the interest will continue to tick over in the background. Your student debt won’t affect your credit rating, because student loans are not included on your credit reference file.This is often something people wonder about when getting a mortgage – but your student loans won’t affect your likelihood of getting one. I’m a postgraduate student, what will I owe? Like undergraduate students, you'll be charged interest from the day of your first payment. The interest rate is currently RPI + 3%. You'll only pay back 6% of your income that's over the repayment threshold (currently £21,000). What about if I’m a part-time student? The same requirements and repayment thresholds apply if you’re a part-time student. Read more about part-time students and finance. Your repayments are calculated on how much you earn, not on how much you borrowed. If you're funded via Student Finance England and studying full-time, you only start paying back your loan when you are earning above the repayment threshold. This is £25,725 (as of 6 April 2019). If, after leaving university, in any one year you’re not working or earn less than the threshold, then you don’t have to pay back anything on your student loan. This works the same if you study in Wales, Scotland or Northern Ireland, except the salary thresholds for repaying your loan are different. If you earn a lot, you’ll repay a lot of your debt; however, you could end up paying back less than those earning a bit less and repaying over a longer period, as you won't pay as much interest. 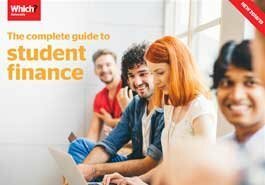 Learn about tuition fees, maintenance loans, repayments and more: read our full guides to student finance in England, Scotland, Wales and Northern Ireland. Any outstanding debt you owe after 30 years is written off, even if you haven’t paid anything back during that time (because you weren’t working or you were earning below the repayment threshold). A major 2014 study by the Institute of Fiscal Studies into university funding (entitled 'Payback Time?') estimated that around 73% of graduates won’t have paid back their full loan back after 30 years. So either you’ll be lucky enough to be in the top group of graduate earners, or you’ll never pay everything back. For this reason, paying your loan back early isn’t always worth doing, either. Are repayments likely to change in the future? There are no guarantees that these repayment rules will remain the same for the next 30 years. However, major overhauls to how the system works are usually more likely to affect new students rather than students already in the system. That said, it's worth keeping an eye on changes or new rules as they're announced, so you can work out if these will affect you and how much you're paying. An interest-free overdraft offered as part of a student bank account can offer a short-term cash injection if your maintenance loan doesn't stretch far enough. You should use this sensibly and sparingly – remember, you'll have to pay it back. Read our guide to student banking to learn about picking the right student bank account, overdrafts, credit cards and more. As well as tuition fee and maintenance loans you receive via student finance, universities and colleges offer their own financial assistance. This can range from one-off bursaries to help with your living costs to scholarships that cover your tuition fees in full. The good news? Unlike your tuition fee and maintenance loans, you don't need to pay these back. But what's available will depend on the institution. This sort of financial support is often aimed at students from low-income families, as well as those who've demonstrated great potential; often this is academically (ie through achieving high grades at school), but can also be in an area related to what they're studying (eg music or sport). There are also hundreds of private charities and trusts that might be able to help, but this is more likely to be a smaller one-off payment, rather than paying your whole loan. Many full-time students take up part-time work around their studies or during holidays. As well as taking some off the pressure whatever you receive in student loans, it's great experience for that blossoming CV of yours. Most universities and colleges run 'jobshops', to help students find jobs in the local area; otherwise, get ready to pound the pavement with your CV in the first few weeks of term. There's no need to wait for all your university offers to come through; you can start applying while you wait (and avoid these five funding delays that trip up many students). The earlier you apply, the better you can sleep soundly knowing that your loan will arrive in time for the start of term.